When I studied abroad in Sicily, I often picked up sea glass, cool rocks, shells, and other treasures on the beach. Thus far I have been displaying it in cool jars or just scattering it around some vases, but I'm always in continuous search for a more permanent, archival type of display and ran across this picture. *I ran across this picture several days on a blog I follow and can't figure out which ones, so my apologies to the artist. I would love to give you credit so let me know who you are and I can link you! 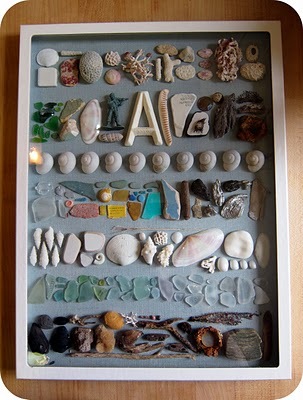 I love the sea glass mixed with the shells and pottery and such arranged in the line patter. I have the same-ish collection of stuff and thought of a similar arrangement maybe in a circle or diagonals. I think I might be going for this basic idea though. My only problem: Anybody know how they glue the glass down without seeing glue? I used Gorilla Glue to glue buttons on my glass bottle hummingbird feeders. I think there is a clear-drying gorilla glue and it works great. Love this idea, I think it is darling! I think it's so cool you studied in Sicily! That's where my family is originally from. I would say a glue gun, making sure it covers the entire back of the glass? But I normally avoid working with glue guns as I hate the little string you end up with in the end..